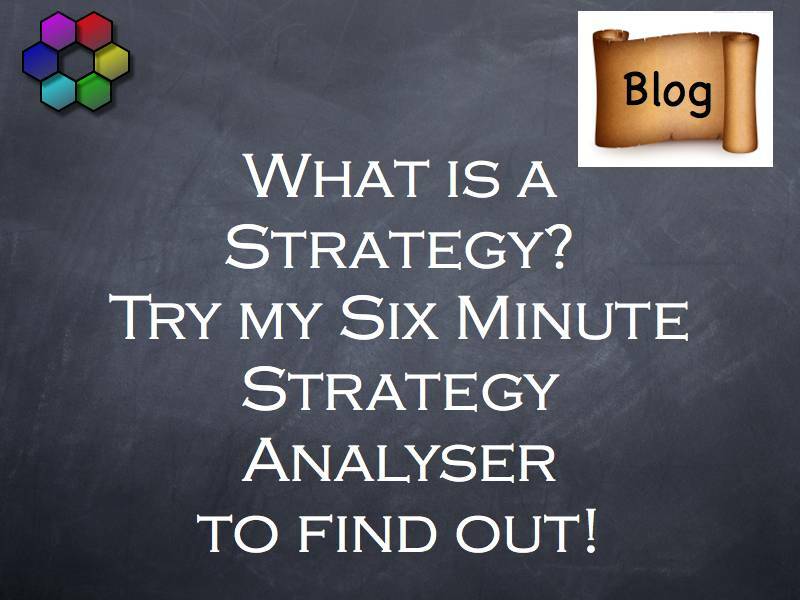 In this Six Step Strategy Analyser, I will help you to create a framework for your business strategy and objectives for the next three to five years. To me the essence of strategy is setting the direction for your business and this tool is designed to help you to start that process. 2. Where do you want to get to? If you are going to set a clear direction for your strategy you are going to have to have clear and measurable objectives. In order to know where you want to go, you need to know where you are starting from. Yes! 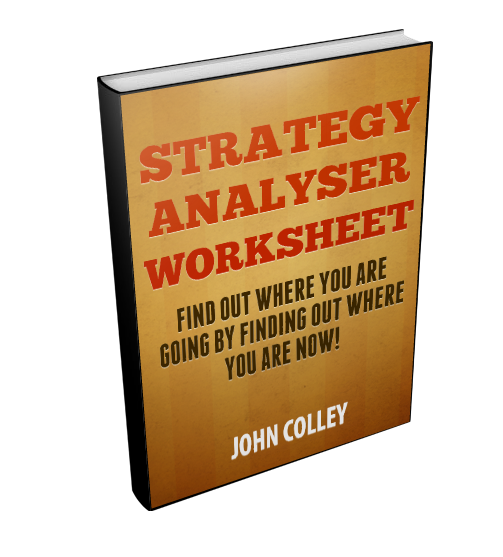 Send Me My Strategy Analyser Worksheet today! 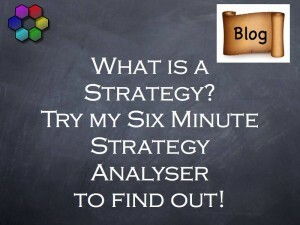 – I want to Gain Further Insights into my Business Strategy! You can review and download the SlideDeck, which I have posted on Slideshare, below. Firstly we need to establish – Where are you now? I have three questions to ask you. 2 Last year’s Profit before tax? Where do you want to be in three or five years time? Chose either time frame or a longer or shorter time frame to suit your own agenda. 1 Revenues – What forecast revenues do you expect to have? 2 Profits – What are you forecasting your Profits before Tax (“PBT”) to be? 3 Employees – How many Employees do you expect to have? What are your Current Strategic Metrics? Using the data you input in Step 1 calculate the following three current strategic metrics. 1 Profit margin? Divide PBT/Revenues to obtain your Pre Tax Profit Margin. 2 Productivity? Divide Revenues and PBT by the number of Employees to get a measure of your productivity. 3 Business Value? Use simple PBT multiplier. These are only approximate and in practice business valuation is much more complicated than this. What are you future implied key metrics? Now calculate the same metrics for your forecasts from Step 2. Using which ever time period you chose at the beginning, 3 or 5 years or your own time period, what has been you Historic Rate of Annual Growth? Then what Implied Revenue Growth are you factoring in to achieve your revenue target? How does this compare with your historic rate? Calculate the difference between the historic and implied growth rates. Are you expecting to grow at a higher or lower rate than you have in the past? What are the deltas for profit margins, staff productivity and business value? Calculate the differences and enter them into the Worksheet. If there is a big delta, I.e. you need to grow much faster than you have grown historically? Is there a significant delta in profitability? Is there a significant delta in productivity? What is the increase in the Valuation of your business? In this Step we bring it all together. Now ask yourself what are you going to do to achieve these objectives? 1. Organic Growth – can you achieve your forecast targets purely through Organic Growth? If this is your choice you need to start asking your self what you need to do within your business to make this possible. 2. Acquisitive Growth – if the differences are too great, will you need to make an acquisition or more than one? 3. Raise additional Capital? If you need to accelerate your growth but do not want to make acquisitions, it is likely that you are going to need additional capital? How are you going to raise this? Next Steps – What are you going to do? The first thing is to revisit your answers for each step and ask yourself what are your underlying assumptions for these answers and do you need to make any revisions? If you did a three year assessment, try doing five and vice versa. Tip: One comment on Valuation. The multiple that you sell your business for can be as great if not a greater factor in creating capital value for shareholders than the level of profits and your planning should build in a plan to make your business more valuable not just more profitable. I hope your found this useful. If you want to conduct a more comprehensive strategy analysis and objective setting exercise, give me a call today to see how I can help you. You can email me at john[at]jbdcolley[dot]com or call me on +44 7813 672 612. ← Raising Venture Capital? 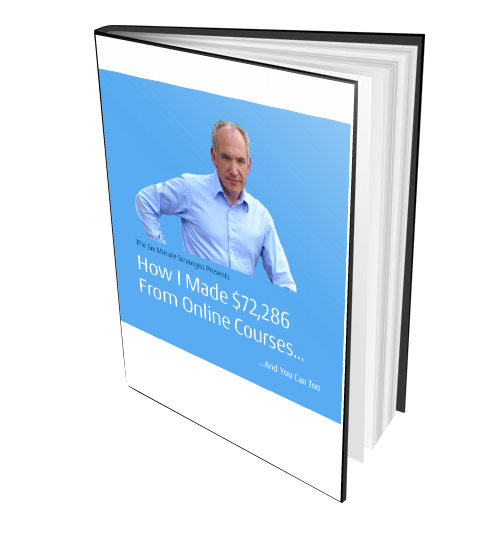 Before you do, take a look at my Course!